I received my August Birchbox this week and I’m pretty excited to try these products. Caitlyn Cosmetics Cleasing Balm – its heavily fragranced but it sure is pleasant fragrance! Juliette has a gun – quite an interesting name, however fragrance is pleasant. yet to test its lasting power which could be deal maker or breaker for me. Model Co Shimmer Bronze – slightly muddy on my skin, however if I mix with Mac Peachtwist looks darn good! 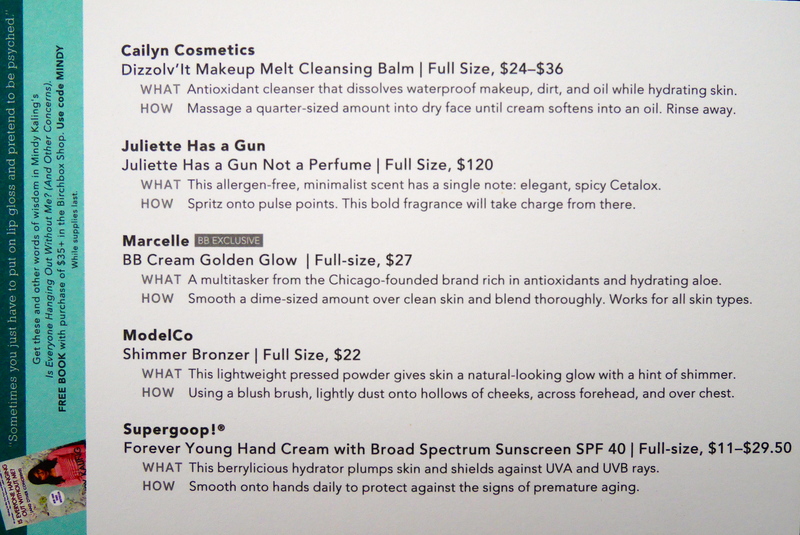 Supergoop Hand Cream SPF 40 – Haven’t tried the product yet however it will be making its way to my car soon. the idea of having spf hand cream when driving makes lot more logical sense to me. Have you tried any of these products? what do you think of em? ← Indeed Labs – Hydraluron & Peptabright…Indeed Splendid!